updated: this contest is over, go to bottom to see winners Today, 9BlogTips.com & Zyma Technologies are happy to hold this unlimited web hosting contest. We’re giving three (3) unlimited web hosting at Zyma web host for one (1) year with full completed features like standard users. Check out more web hosting features of Zyma at http://www.zyma.com/features/. Launched in 2010, Zyma is one of the fastest growing web hosting companies in the UK (based in Basingstoke) with many affordable web hosting packages. Zyma is serving the users at 80+ different countries and growing; by providing high quality hosting services and reliable unlimited web hosting; Zyma won many web hosting awards: Preferred Shared Host, Top UK Shared Host, Top UK Host; become become the recommended web hosting provider is Zyma’s vision. How to win the free web hosting account? Retweet or share (on Facebook) about this unlimited web hosting giveaway and write a comment with the link you made. This unlimited web hosting contest will run for 14 days, we’ll announce the winners on 26 September 2012. First 3 lucky winners will be selected randomly (random.org) from valid comments. Good luck! Now it’s time to pick 3 lucky winners by random.org. 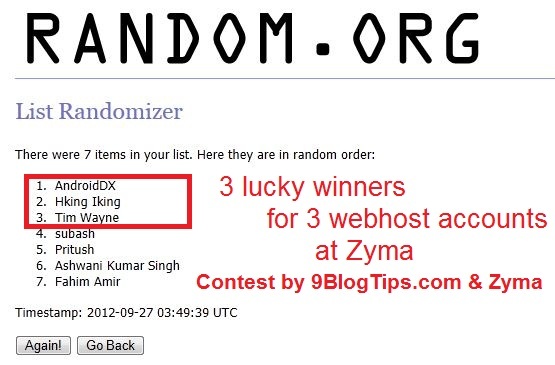 I just random 1 time, and here’s result: 9BlogTips.com gave emails of 3 lucky winners, Zyma should contact you soon. Please write a comment on this post to confirm, many thanks. Please count me in for this awesome giveaway. Wow! 🙂 I won. in the second place. Received my prize 🙂 Great thanks.